The concept of heresy is deeply rooted in Christian European culture. The palpable increase in incidences of heresy in the Middle Ages may be said to directly relate to the Christianity's attempts to define orthodoxy and establish conformity at its centre, resulting in the sometimes forceful elimination of Christian sects. 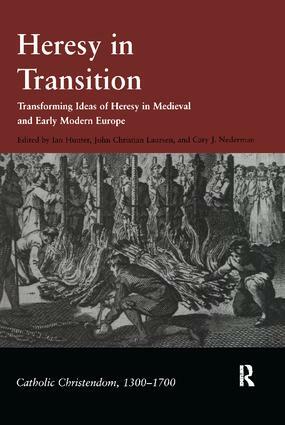 In the transition from medieval to early modern times, however, the perception of heresy underwent a profound transformation, ultimately leading to its decriminalization and the emergence of a pluralistic religious outlook. The essays in this volume offer readers a unique insight into this little-understood cultural shift. Half of the chapters investigate the manner in which the church and its attendant civil authorities defined and proscribed heresy, whilst the other half focus on the means by which early modern writers sought to supersede such definition and proscription. The result of these investigations is a multifaceted historical account of the construction and serial reconstruction of one of the key categories of European theological, juristic and political thought. The contributors explore the role of nationalism and linguistic identity in constructions of heresy, its analogies with treason and madness, the role of class and status in the responses to heresy. In doing so they provide fascinating insights into the roots of the historicization of heresy and the role of this historicization in the emergence of religious pluralism. Ian Hunter is a professor at the Centre for the History of European Discourses, University of Queensland, Australia. John Christian Laursen is a professor in the Political Science Department, University of California, Riverside, USA. Cary J. Nederman is a professor in the Department of Political Science, Texas A&M University, USA.